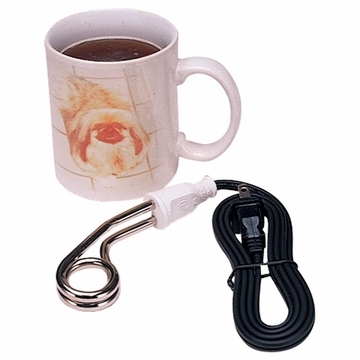 Great for heating water or beverages while traveling. One time only safety cutoff switch shuts power off permanently if container boils dry or if heater is removed from liquid before being unplugged. The Watta Heater is copper nickel plated and runs on 110V for use in North America or can be used with the Converter Kit overseas. Comes with burn guard, nylon pouch and 37" cord.